The many reported atrocities created by the Department for Work and Pensions (DWP) since 2010, when masquerading as welfare reform and austerity measures, created an environment of **fear and anxiety within the disabled community dependent upon State financial support. Now, seemingly, the same unjustified political attack against the sick and disabled population has also created opportunities for other government departments to intimidate those least able to protest, including the Department for Transport (DT). 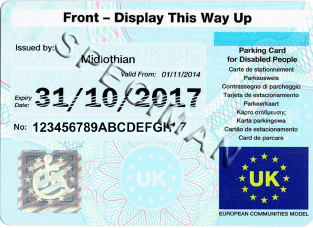 The award of the Blue Badge is the guarantee that chronically ill and disabled people, who have significant and often permanent chronic illness or disabilities, can access the local shops and community when able to park close to public access. Without this parking priority, many chronically ill and disabled people would be permanently housebound. The resistance to supply a new Blue Badge was brought to my attention recently when I received an email reminder from the local County Council, advising that my parking Blue Badge was about to end on 29th May, with a suggestion to re-apply as soon as possible. the Blue Badge Improvement Service”. When I challenged this unacceptable contact, Customer Services at the local County Council advised that it was “out of our hands” as they are an “administrating authority” and the email reminder notice is dictated by the DT. Having spent **eight years researching and exposing the American corporate insurance influence with the DWP welfare reforms, I was totally unaware that the essential Blue Badge would be placed under threat by the DT by a right-wing government whose social policies continue to demonstrate that suspicion, and a presumption of guilt and wrong-doing, is attached to all policies impacting on welfare. Despite having a permanent condition, the County authority will not provide the Blue Badge for longer than three years, thus making sure there is a ready stream of income, and a ready opportunity to intimidate chronically ill and permanently disabled people, who can’t recover. Another example of the inadequate ‘one size fits all’ mentality. There remains no comprehension by under qualified administrators that someone with a permanent health condition, or disability, can’t miraculously recover despite attempted intimidation. What is guaranteed is that the relentless intimidation, first by the DWP and now by the DT, demonstrates that no-one with a profound health problem will ever find peace again and this insecurity has caused preventable harm against those least able to protest. In any other circumstance, this relentless intimidation would be deemed as government tyranny. The endless thinly veiled threat that minimal welfare benefit, needed for financial survival, can be removed at the whim of an underqualified DWP administrator has contributed to many deaths, which the national press continue to resist informing the British people. Now, the essential Blue Badge is no longer secure. Every 3 years I go through exactly the same even though I’ve been in receipt of a Blue Badge since it was introduced in place of the Orange Badge which I’d had for many many years before that. Horrendous experience every time. I feel it’s more than intimidation, I truly feel it comes under the umbrella of Harassment. Definition: the act of systematic and/or continued unwanted and annoying actions of one party or a group, including threats and demands. No one mentions the continued starting and stopping of people’s Council Tax Benefit and Rent Benefit. I know someone who is constantly having their rent and Council Tax Benefit stopped for the most trivial of excuses for paperwork for their files. My dad doesn’t claim any benefits but he has severe advanced AS. His lower back is completely seized now and there is absolutely nothing they can do for him, he was refused a Blue Badge. I am in the process of applying again for him. He absolutely needs it, it is highly dangerous for him to walk far, increasing the risk of falling and actually breaking his back, the absolute pain he suffers can be clearly seen in his face. The pain killers hardly touch the pain he suffers now. Apparently needing space to get in and out of the car doesn’t count toward a Blue Badge. The woman I spoke to was very pleasant but went on to diss the GPs for “giving out Blue Badges to anyone”. My dad asks for nothing so when he asks for a Blue Badge I can assure anyone that he NEEDS it. The clue is in the word “government”. They are government agencies and the Conservative Party has been the government for the past seven years. It is neither intimidation nor harassment it is merely them reminding the badge holder that it will become invalid after 29th May and if they want a replacement one they better apply in enough time to process a replacement. Surely it better to receive a reminder than not. My children are entitled to concessionary bus passes and these have no reminders issued before they expire and if you do not monitor it the first you know is the bus driver asking for money for a bus ticket as your pass in no longer valid. Erm, just because we may be entitled to a Blue Badge doesn’t mean we can’t be responsible for knowing when our badge expires! The councils I’ve lived under have never contacted me to remind me it was time to apply for anew badge, the onus has always been on me! Sorry, but I found your reply a tad demeaning to us disabled people.